Life. (cue violins) It sometimes gets in the way of blogging. I don't even know where to start with everything that's been going on, so let's just say that my family and I have been living in "interesting times." You know what I mean? Like the old curse. Bleah. Nonetheless, we're still here! :) We have each other, we're in fairly good health, we have the most wonderful friends in the world, and my business has been doing well. But my husband could use all the good juju and happy thoughts you can muster! 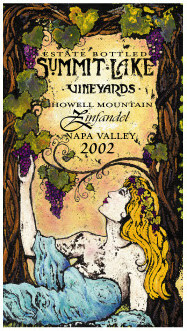 It's an update of a wine label I did. It's great wine made by a little family winery on Howell Mountain in Napa County (I didn't do the website). And they are the nicest people. I do have to mention that a very dear knitterly friend of mine gave me a kit for the A Line jacket from More Sweaters that I have wanted to make for quite a long time. She is totally da best. I can't wait to have enough brain to start this gorgeous thing. And I have to say that the fact that a lamp fell on my head today is *not* helping! Anyway, the above link goes to a picture of Sandrine in her finished jacket, and those of you who have not seen her absolutely amazing gallery should take a few moments. Her knitting is *incredible*! Well, off to make some more pins. :) I missed y'all! Woo! Welcome back! Sending good wishes your husband's way. That wine lable is GORGEOUS! I love your work. I am sending all the good juju I can Clint's way. Kiss the boys for me. Should we do another round of martini pins? Sending you guys all the good juju I can muster. Glad you're back and I hope all is well. Sending lots of juju your way. Hey, we missed you too! We know all about "interesting times" over here. Ah, I forgot--that wine label is Fantasic, with a capital F! You're back! Many good wishes from up North for your dear hubby. I have one of the other Takle/Kolstads in stash. Later this year? Nice to see you're back Rosemary! What a great wine label! No more headlamping, okay? So were you out like a light? I'm remembering the time I was at a friend's house with a bunch of people, bent down to tie a kid's shoe, stood up from under a tree I hadn't realized the kid had squirmed closer in towards, and bonked myself out of commission for a moment there. Right in front of everybody. Out cold. Good times. Best of wishes to your hubby! Sending the best good vibes to your hubby. Hey, I have yarn for a Takle/Kolstad too! I'm sensing a knitalong here.... The label is just beautiful, and all good juju for your husband!